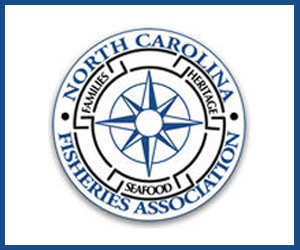 Nils E. Stolpe: After 39 years of NOAA/NMFS fisheries management, how are they doing? 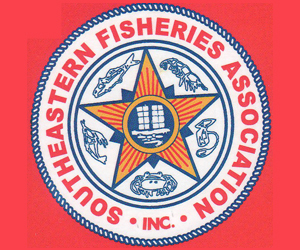 January 27, 2016 — (FishNet USA – www.fishnet-usa.com/) — Back in June of 2012 I wrote After 35 years of NOAA/NMFS fisheries management, how are they doing? How are we doing because of their efforts? 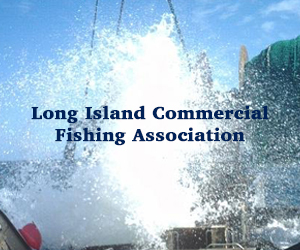 (http://www.fishnet-usa.com/) in which I looked at U.S. commercial landings on a regional basis. While there were some bright spots, overall the picture was somewhat dismal, with total landings minus Alaska’s swinging up slightly after a trending downward over the previous 5 years and being only 60% of what they were in 1979, the year that inflation corrected landings were at their highest value. 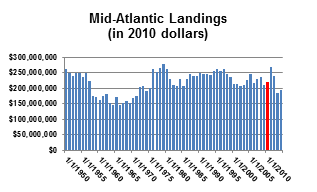 Regionally, landings (minus scallops and lobster) in New England, in the Mid-Atlantic (minus scallops), in the Southeast and in the Gulf of Mexico were trending downwards with only Pacific landings heading up. 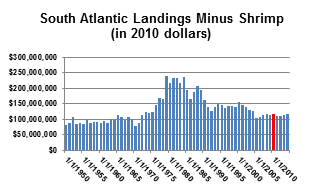 The latest available data from the NOAA/NMFS Commercial Landings website, for the years 2011 to 2014 (http://www.st.nmfs.noaa.gov/st1/commercial/landings/annual_landings.html) tell a different, and much more optimistic, story (But please bear in mind that any indicated “trends” since 2010 are for four years at most and at this point aren’t necessarily anything that people should hang their hats on). Total U.S. landings reached a maximum of $6.8 billion in 1979. From a recent low of $3.9 billion in 2009 they increased to $5.2 billion in 2011 and are currently (as of 2014) at $5.0 billion. 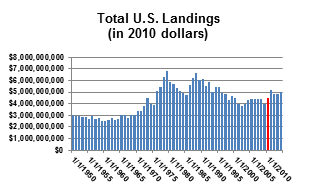 The value of total U.S. landings has been increasing fairly steadily since 2002. A number of people had commented on the original article that it would have been interesting to see a listing of all of the commercial species and their individual contributions to the total value of domestic landings. With landings of 485 species reported in 2014, that would take up a prohibitive amount of space here, but following is a chart listing the top 50 fisheries in terms of value. At the bottom of the list were frigate mackerel ($39), shortbelly rockfish ($22), Chubs ($12), redstripe rockfish ($10) and spider crab (42 lbs landed, no value listed). The values are in 2014 dollars. For reference I’ve also included a chart of the top 50 species in 2005 (the values here are listed in 2004 dollars). It shouldn’t surprise anyone at all familiar with our commercial fisheries that American lobster, sea scallops and walleye pollock are the three most valuable U.S. fisheries. But that seven of the ten most valuable species being shellfish might be. At this point NOAA/NMFS doesn’t differentiate between capture fisheries and aquaculture production in the commercial landings database. Tracking the growth – or not – of aquculture through actual production would be an effective way of determining how realistic the pronouncements of the “future of aquaculture” which have been periodically resurfacing for almost 50 years actually are and it would be most useful. • Of the top fifty species, twenty-three were shellfish. • In spite of all of the associated hand-wringing, Atlantic cod were #69 ($9.4 million). 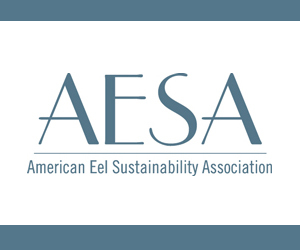 • Ditto for American eels at #66 ($9.8 million). • Ditto for swordfish at #51 ($18 million). • Bloodworms were #86 ($6.0 million). • Florida stone crab claws – the fishermen keep one, the crabs keep one and are then released – were #35 ($28 million). Forty-five fisheries that were in the fifty most valuable in 2005 were still in the top fifty in 2014. When adjusted for inflation, in 2010 dollars, landings in the top 50 fisheries were valued at $3.9 billion in 2005 and at $4.5 billion in 2014. Ignoring Alaska, the value of U.S. landings appear to be increasing after a decline that began in 1979. Correcting for inflation, total U.S. landings in 2014 were 74% of what they were at their highest point (1979). 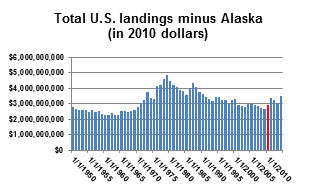 Minus Alaska, total U.S. landings were 71% of what they were in 1979. Starting out in New England, home of our oldest and not so long ago some of our most valuable “traditional” fisheries, at first glance things appear to be rosy. Reaching a post-Magnuson plateau of just over $1 billion in 1987, the value of total landings declined from then until 2001, from there increasing until almost $1 billion in 2005 and then falling again. But in 2011 they topped $1 billion again, and have remained there ever since. Unfortunately, the reality in many New England fisheries is not what is indicated by the total landings. 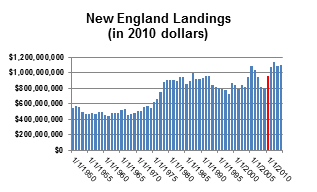 Since 1950 about half of the value of New England landings (converted to 2010 dollars) has been in the lobster and sea scallop fisheries. In 2010 these two fisheries accounted for 41% of the value of New England’s total landings (in the previous FishNet I had erroneously reported “over 69%”). In 2014, driven by a large increase in lobster landings which wasn’t offset by smaller decrease in scallop landings, that increased to 47%. 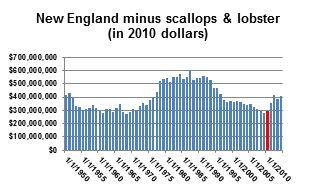 Subtracting the value of sea scallop and lobster landings from the total New England landings, there ws a decline in value extending from the early 90s to 2009. This was offset by an increase beginning in 2010 that increased the value to levels last seen in 1995. 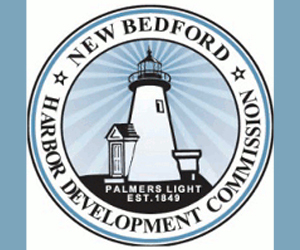 In 2010 dollars, the New England lobster fishery has increased in value from $73 million in 1950 to $518 million in 2014. That’s an increase of 700%. The sea scallop fishery has increased from $57 million to $273 million, an increase of 480% (“record” scallop landings were $370 million in 2012). In 2014 the next three most valuable fisheries were oysters, soft clams and Atlantic herring. Together with sea scallops and lobsters, landings in these 5 most valuable fisheries were $941 million. This represented 85% of the total New England landings in 2014. In 2000, 2005 and 2010 the 5 most valuable New England fisheries represented respectively 57%, 68% and 77% of the total value of New England landings. With the exception of 2013-14 the total value of Mid-Atlantic landings appear to have been fluctuating pretty widely but staying mostly between $200,000 and $250,000 since the early 1980s. However, the dramatic increase in the value of sea scallop landings have been compensating for a pronounced and prolonged decrease in the value total of landings of the other fisheries. The value of South Atlantic landings declined almost steadily from a peak at in 1979 to 2005 or so and has been fairly constant since then. 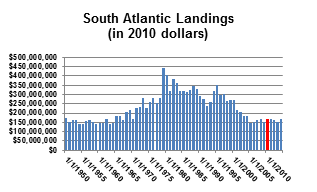 Commercial landings in the South Atlantic in 2014 were 38% of what they were at their highest point (1979). The value of commercial landings in the Gulf of Mexico declined until 2010, when it reached the level that it hadn’t been at since 1960. Since then the total value has increased significantly, in 2014 being at 67% of what it was in 1979, when they were at their highest value. As in the South Atlantic, the value of shrimp landings has varied much as the value of the other species has. The value of total West Coast landings appears to be continuing a 10+ year upward trend which had been interrupted by a drop in 2009/10. 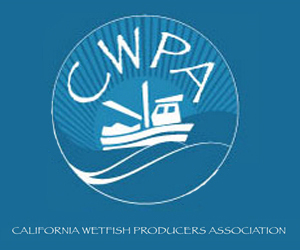 The total value of West Coast landings in 2014 was 69% of the highest value, which was in 1988. 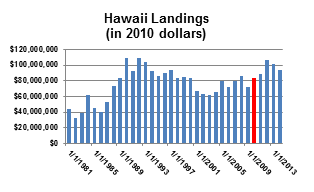 The value of Hawaii landings in 2012 almost equaled the highest level reported, which was in 1992 (Hawaii landings were only reported in the NMFS/NOAA commercial landings database beginning in 1981). The value of landings has dropped in the subsequent two years. 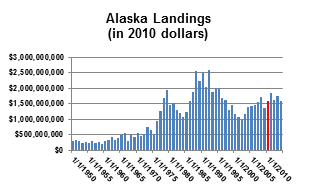 The total value of Alaska’s landings appears to have resumed the upward trend that had begun in 1985. Looking at the biggest picture – and accepting the NOAA/NMFS figures – the domestic commercial fishing industry is doing quite well, having been just under $4 billion in 2009 and in 2014 having topped $5 billion. Adjusted for inflation, landings of the most valuable 50 fisheries were worth $3.9 billion on 2005. The value of the top 50 species had increased to $4.5 billion in 2014. However, as is almost always the case, the devil is in the details, and some of those details clearly demonstrate that all is not well in every pilot house of every boat fishing in our EEZ. One of the clearest examples of that is seen in the traditional fisheries of the Mid-Atlantic. While the value of total landings were valued at $195 million in the Mid-Atlantic, 44% was from one fishery (sea scallops). 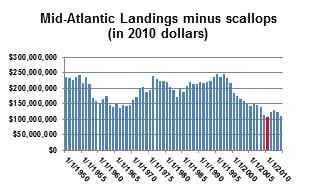 When the value of total landings minus the sea scallops shows that a decline that started in 1997 in the Mid-Atlantic is still continuing. New England is slightly more complicated. In 2014 the value of landings if two fisheries (lobster and sea scallops) made up 73% of the value of New England’s total landings. In 2000 they accounted for 53% of the total. While the value of landings minus lobster and scallops has increased over $100 million since 2010, the four species – herring, soft shelled clams, oysters and American eels – that have accounted for most of the increase are either caught by very large vessels, are mostly from a limited and highly regulated river fishery for elvers, or are harvested from either inshore fisheries or aquaculture operations. The bright spot on the East coast is the South Atlantic region, if you consider having stable landings a bright spot. 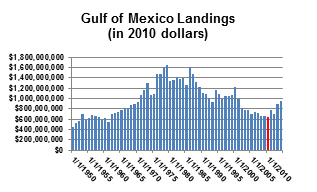 The value of total U.S. landings in the Gulf of Mexico has increased dramatically since a post-Magnuson low point, not coincidentally the year when BP released 5 million barrels or so of oil and almost 2 million gallons of corexit (an oil dispersant) into the Gulf. 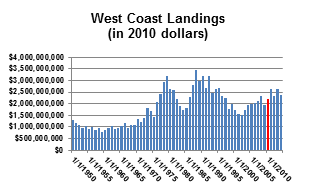 After a gradual increase from the early 90s, the value of West Coast landings (minus Hawaii and Alaska) has been fairly steady since 2010 with an upswing in 2014. The value of Alaska landings increased significantly post 2010 but in 2014 had fell back to the same level it was at then. The value of Hawaiian landings increased steadily from 2009 to 2012, when it reached a level it hadn’t been at since 1993, but it has decreased since then. Obviously it’s impossible to generalize at the national level much more than that significantly more dollar’s worth of fish and shellfish crossed U.S. docks in 2014 than did in 2010, and that’s definitely a good thing. However, the benefits haven’t been spread out evenly. There are disparities from region to region, from state to state, from port to port, from fishery to fishery and from dock to dock. The situation on the New England groundfish fishery is an example of that (and I’ll note here that decreased landings of a particular species isn’t necessarily related to reduced numbers of that species). But what can’t b\e overemphasized is that in far too many instances fishing revenues are being increasingly concentrated in a decreasing number of fisheries. 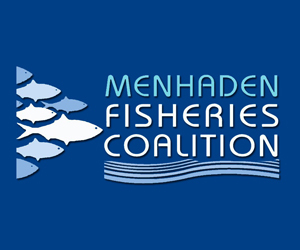 In the long term this could prove disastrous, not just to the participants in fisheries in which the landings are declining, but to the participants in the other fisheries as well. This is because it takes a certain minimum level of presence to maintain necessary infrastructure (docks, gear suppliers, ice houses, marine railways, etc. 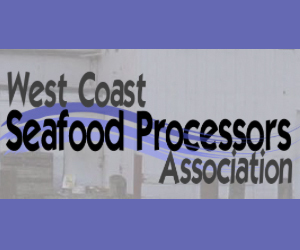 ), and once that minimum level is reached those businesses that support the fishing industry will have no choices other than shutting down or relocating.